Simple Brand Academy Course - Bracken House Branding Co.
Ready to design a beautiful brand that looks professional and will help you grow your business faster? Establish authority through a cohesive, consistent & captivating brand – without spending all your hard earned dollars on a professional designer. ✓ Want to learn exactly how to design a professional-looking killer logo so you don’t have to pay thousands to a designer? ✓ Sick of wasting hours & spinning your wheels in Canva only to end up with the same amateur designs and generic fonts that everyone else is using? 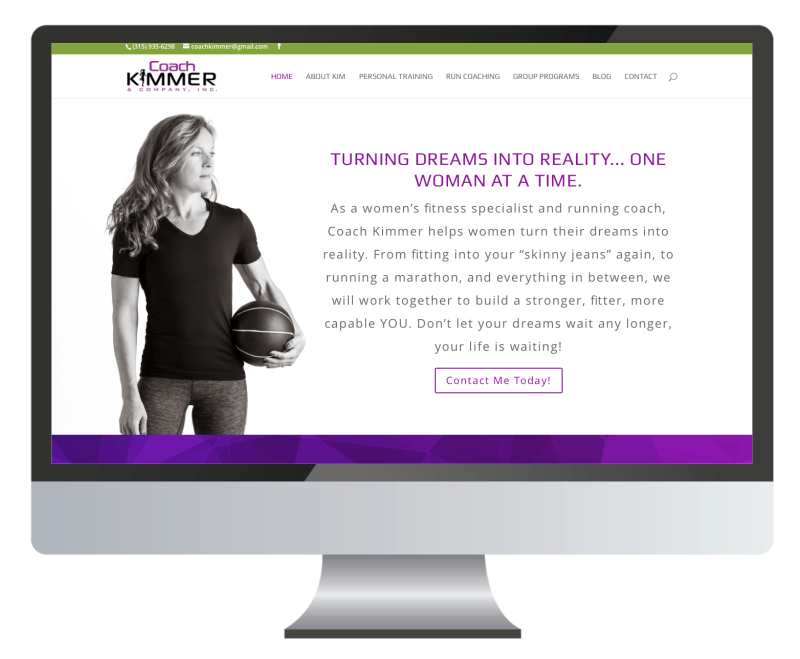 ✓ Wishing you had a beautiful brand and website with a cohesive look and feel – just like the pros? 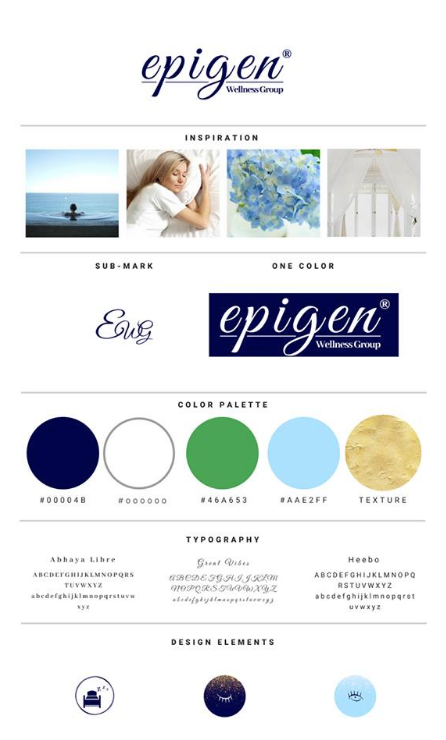 It is possible to have a gorgeous brand that your clients will be swooning over in no time without paying a designer to do it for you. You can do it yourself without feeling overwhelmed by design, spending hours trying to figure it out, and getting stuck along the way. All you need is a simple roadmap and a professional designer to help you each step of the way. ✓ Being seen as a true professional and not just another amateur hobbyist because your graphics are always on-brand, compelling, consistent & cohesive! ✓ Understanding exactly how your brand should look, feel & sound to attract & captivate your buyers, because you will absolute clarity in your messaging! 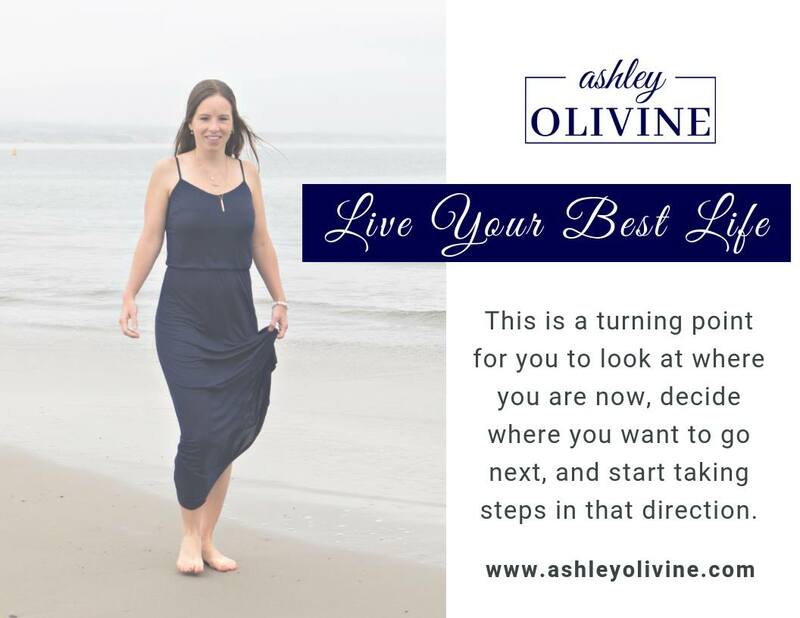 ✓ Make forward progress with your business because you confidently know exactly how to bring your vision to life, so that you can get out of overwhelm! ✓ Knowing design best practices, so that you’re able to create attractive graphics that look professional, rather than generic like everyone else’s! 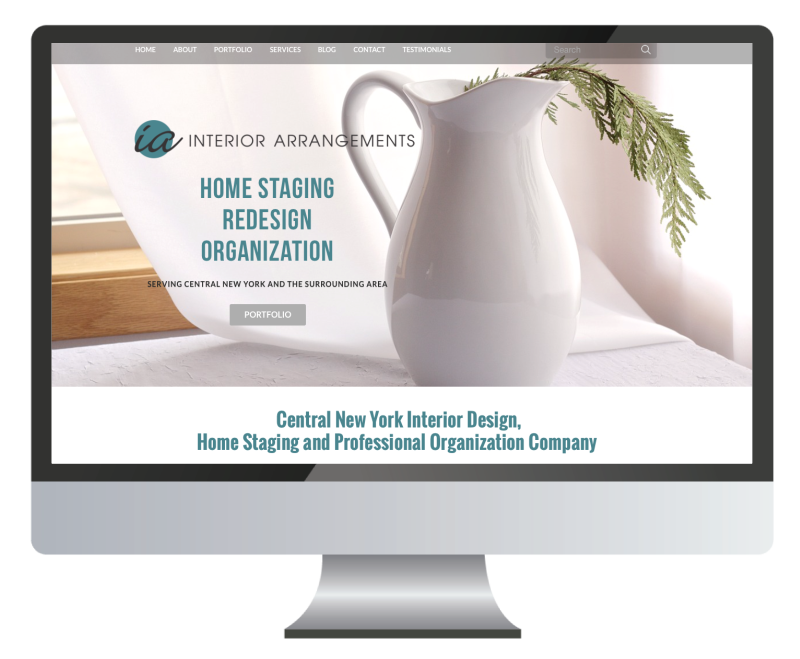 ✓ Saving yourself hours of time, and thousands of dollars because you know exactly how to whip up a beautiful graphic, or website update in minutes, rather than hours! Nothing in this world lights me up more than helping other small business owners and entrepreneurs succeed – and I’ve done this by designing hundreds of brands & websites for the past 14 years. Through years of experience, I’ve learned EXACTLY how to design a brand that gets noticed, gets sales, and shares their message with the world. You could spend years (like I did) studying other brands you admire, and trying to re-create all the things you love about them on your own. But do you really want to waste that much time? Wouldn’t it be a whole lot easier to learn from someone who’s already been there, and has a better solution? A faster & easier solution. DIY’ers are my favorite kind of people! As a self-taught designer, it’s exactly how I’ve gotten to where I am today in my design career, and I’m a huge supporter of those who choose the DIY route. I’m ALL for saving money on overpriced designers, when you can learn how to do something yourself. There’s nothing quite like the pride and joy of being able to say, “I made this myself! !” And you should be proud – it’s a huge accomplishment! If you don’t have the proper skills, tools & resources to help you along the way, DIY can turn ugly, real quick. I’ve seen way too many massive Pinterest Fails over the years by DIY’ers who didn’t start out with the proper foundation, or have the right roadmap to guide them along the way. Without an experienced designer in your corner, you could be putting designs & graphics into the world that quite honestly make your brand look like it was designed by a 7 year old, and you might not even realize it! Through Simple Brand Academy, I shorten YOUR learning curve from 14 years to 8 weeks. Enrollment ends at 11:59 PM EST on April 13th! 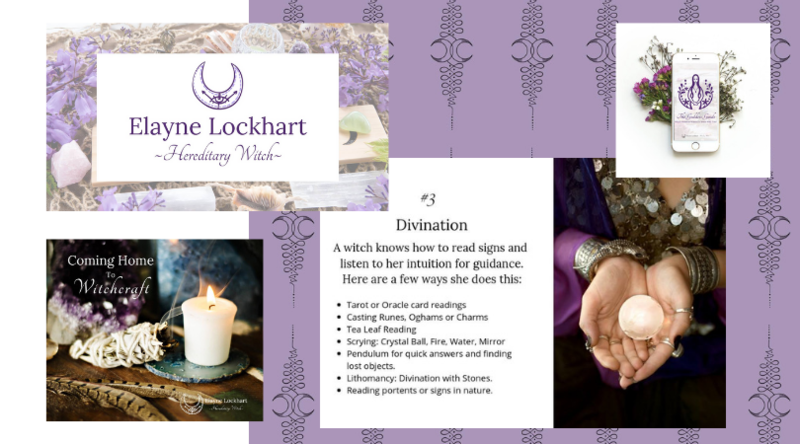 I’ve developed a program that breaks down every step of clarifying and designing your brand into manageable, easy to follow lessons that anyone can do! Truly. Anyone. And guess what? You don’t even need any fancy design software to do it either! 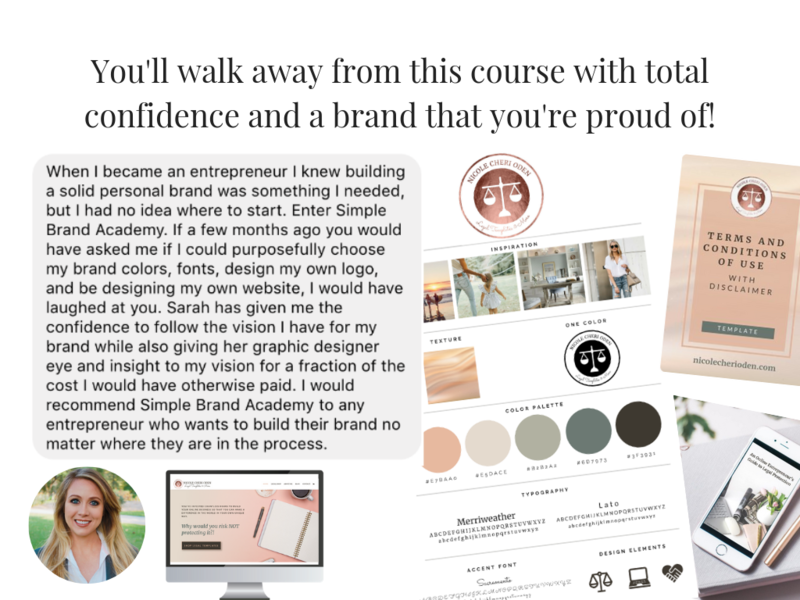 Whether you’re just starting out or re-branding an existing business, this course will teach you exactly how to design everything you need to create gorgeous, professional looking graphics that truly represent you and your brand! 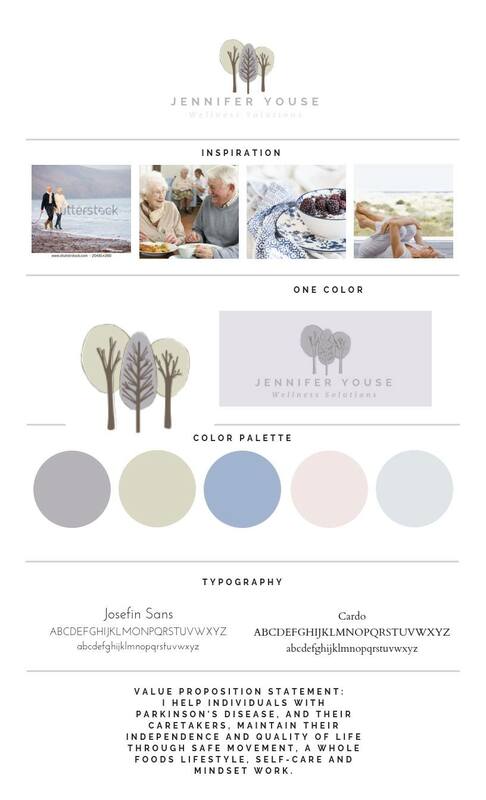 CHECK OUT THESE BRAND STYLE GUIDES FROM PREVIOUS SBA STUDENTS! LEARN HOW TO PLAN AND DESIGN A LANDING PAGE! All while saving yourself literally thousands of dollars! Have you looked into the cost of hiring a designer or an agency to do all of that for you? That’s OVER $4000 you would spend on a designer, and that doesn’t even include the ongoing cost of having someone create your social media graphics for you! 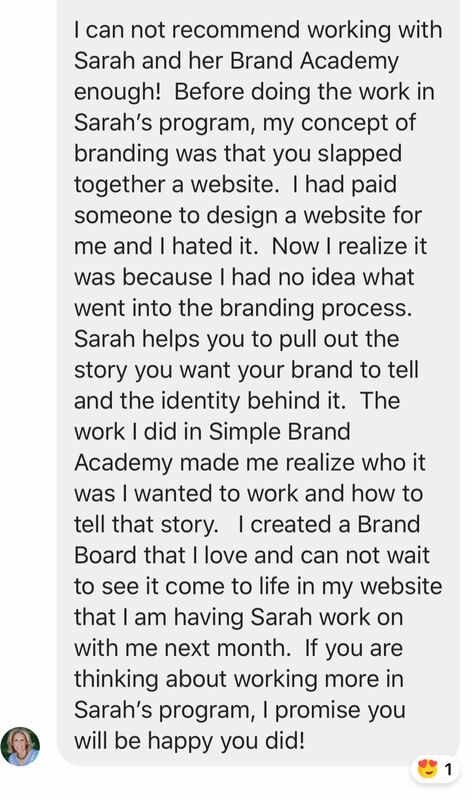 Simple Brand Academy is an 8-week course & group coaching program, based on my 4-part framework, where you will learn how to design your own unique brand, that is unequivocally and authentically YOU! 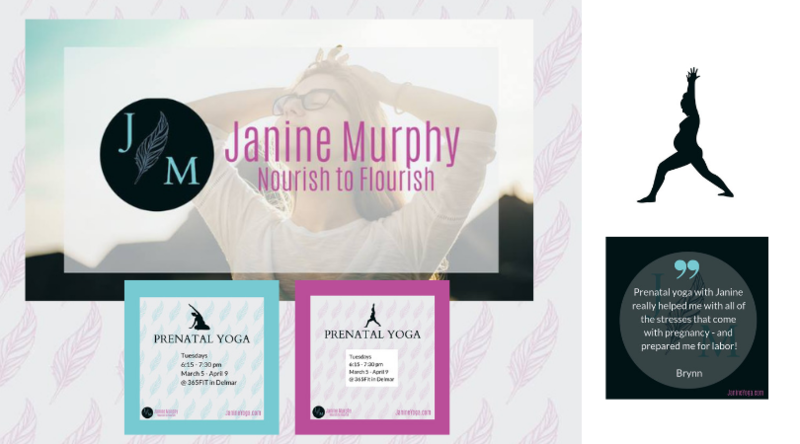 This module takes the concepts of brand clarity a bit further than my popular Mood Board Challenge, and is centered all around finding absolute clarity in your message, your positioning and your niche. The work that you complete here will guide you throughout the rest of the course – as you’ll always refer back to your core brand foundation, to ensure what you are designing perfectly aligns with what you stand for, what you want to be known for, and what your audience needs to hear from you. You’ll learn how to hone in on your unique expertise, and how to set your products and services up in a structured way that makes sense for you, and your audience! The number one thing you need to understand is that your brand is NOT just about having a logo. 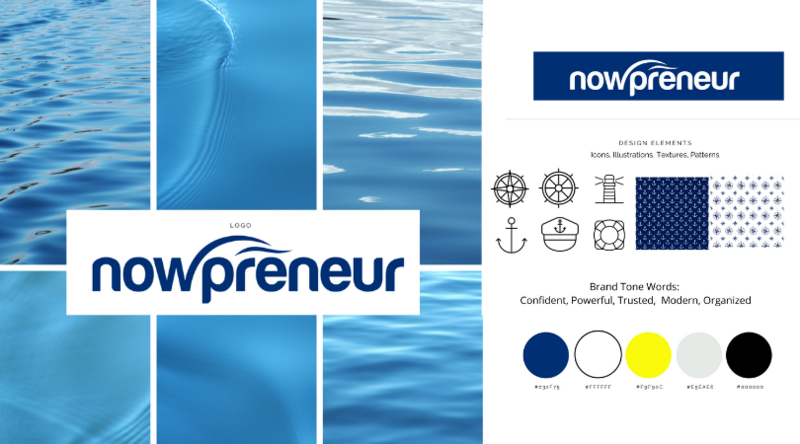 For a brand to be a true reflection of you and your business, you need a set of core design elements that all work together, to create a visual brand identity that is yours, and yours alone. You’ll learn step-by-step how to design your custom logo, with plenty of examples to follow, plus learn how to create your own on-brand icons, illustrations, textures, patterns and brand photos! 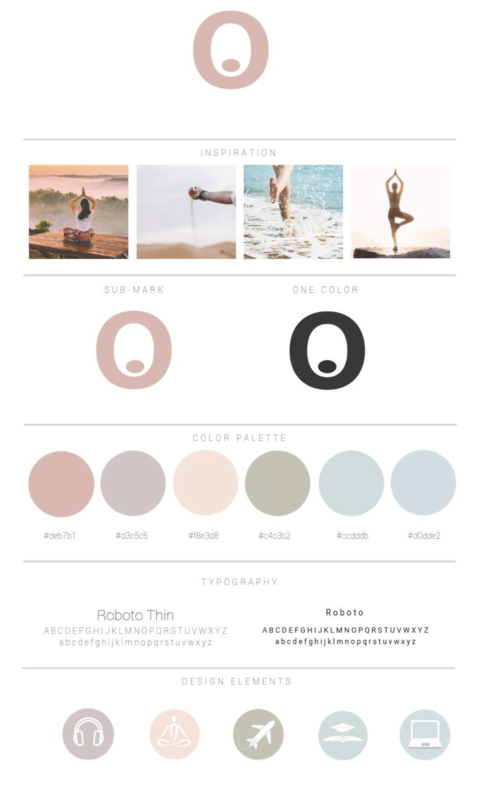 You’ll learn how colors and typography convey different meanings, and how to correctly choose the ones that will help your audience feel a connection with you and your brand. 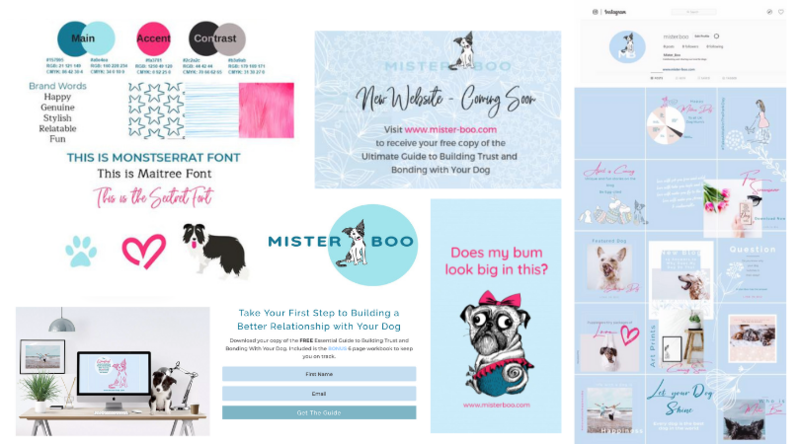 Now that you have your core brand toolkit and all of your design elements, it’s time to put them to use, and create the captivating & cohesive graphics that you’ll use to start spreading your message and sharing your work with the world! Learn all of my top design tips, tricks and best practices that I use for my design clients every day. 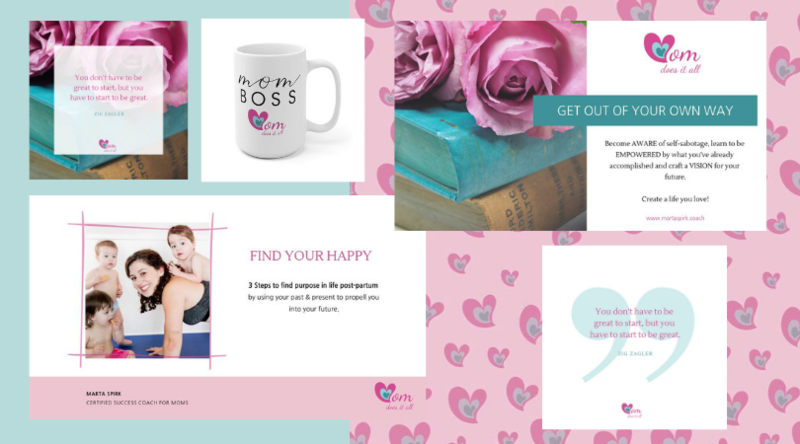 Learn how to create attractive graphics for print & web, and learn my step-by-step process for creating cohesive, compelling and captivating lead magnets, social media posts and printed design – so that you can start attracting the right audience, right away! Finally, it’s time to start building your online platform so that you can build your email list and connect with your audience! We’ll start by mapping out all of the content (text and images) that you will want on your website. Learn how to setup your website tech including buying your domain & website hosting, then installing WordPress and Divi, and connecting everything so that it’s a real, live, actual website. Learn how to setup your branding, including your fonts, colors, logo, images & graphics, so that creating your pages going forward is a breeze! At the end of this module you’ll have your own custom-designed, on-brand landing page (with your lead magnet connected), so that you can start building your email list. Check out these amazing BONUSES that you also get when you purchase Simple Brand Academy! Here’s something I already know about you. You don’t need another course that you’ll purchase, and be left to figure out on your own. So when you join Simple Brand Academy, you’ll also be joining the rest of the students in a private Facebook Group where I’ll be hanging out to answer your questions every week! 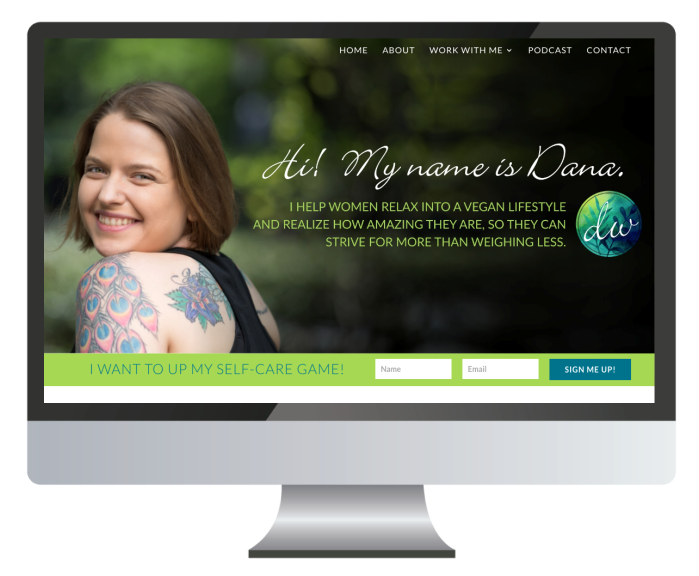 We will also have weekly (recorded) Q&A calls, so that you can get all your questions answered as they come up, and you’ll never feel alone in your branding journey! Why re-invent the wheel, when I’ve already created many templates already? 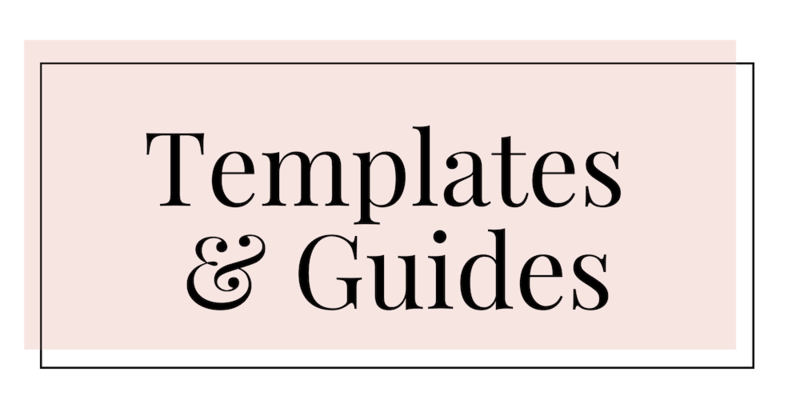 You’ll have access to a variety of my design templates throughout the course. 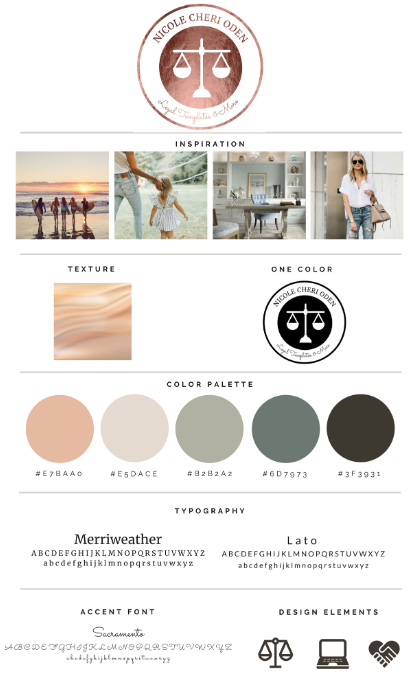 You’ll also receive my Color Palette Guide and my Font Pairing Guide – If color or fonts overwhelm you, you can easily choose from a set of pre-designed palettes and matched up fonts. So it can be as simple as just picking a set you love & saving yourself the stress! 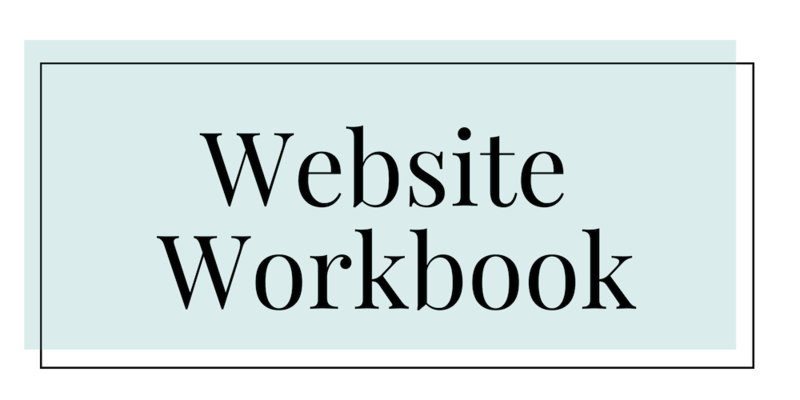 Grab my comprehensive Website Workbook which outlines everything you need to consider when planning out your phase 1 website! 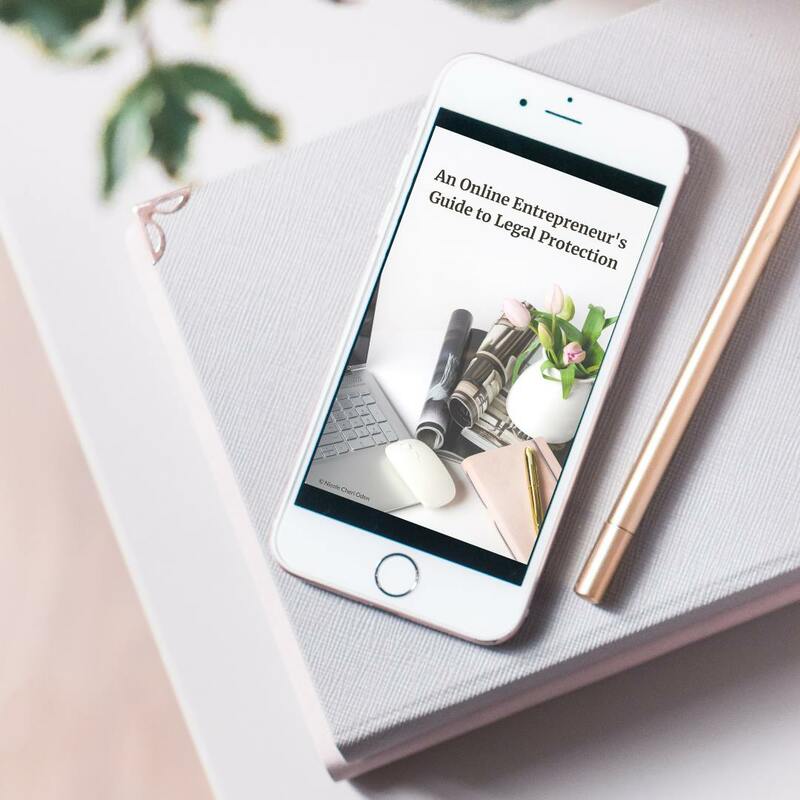 I will guide you step by step through the various things you need to consider, such as setting up a lead magnet, determining the goals of your website, connecting your social media pages, writing your copy, considering SEO keywords, planning your legal pages, and so much more. adding 10 extra months of support!!! 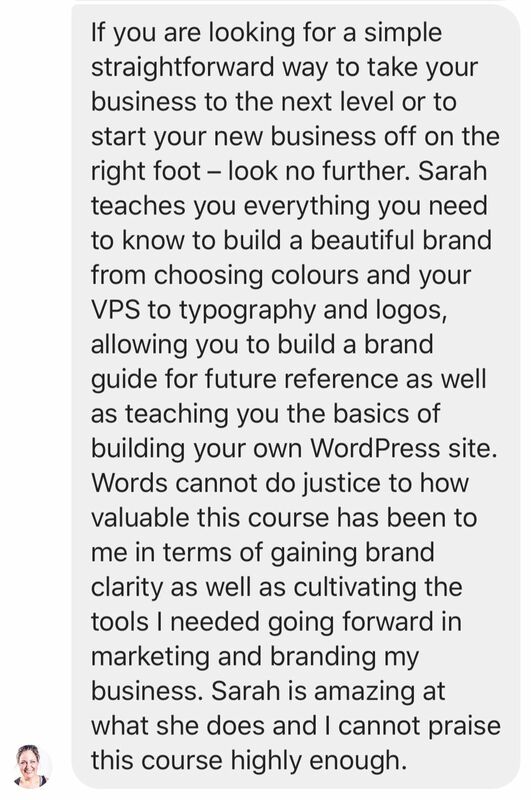 ✓ Tons of supplementary branding & design trainings covering a wide range of topics such as Squarespace, Instagram, Pinterest, Dubsado, Brand Messaging, Email Marketing & more! This is a regularly priced $39/month membership that you will get absolutely FREE for the 10 months following your 8-week course! That’s a $390 value, absolutely free! Take a look at the Simple Brand Success path, and ask yourself, where are you now, and where do you want to be? 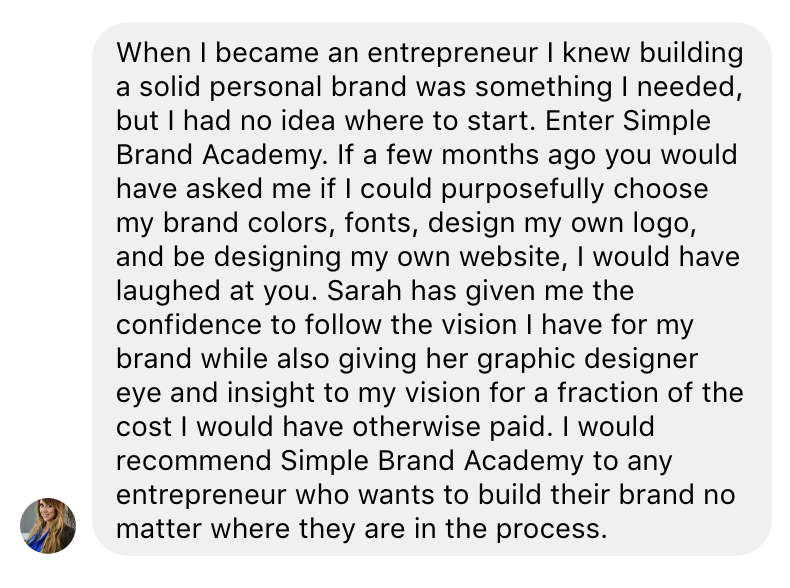 With Simple Brand Academy, I completely guarantee that I can help you gain confidence, clients and cash MUCH faster than if you tried to master branding through trial and error on your own. Then you’ll spend the next 10 months implementing what you’ve learned, refining your designs, growing your platform, and taking your brand to even greater heights! And I’ll be right there to support you, cheer you on, and help you when you fall. 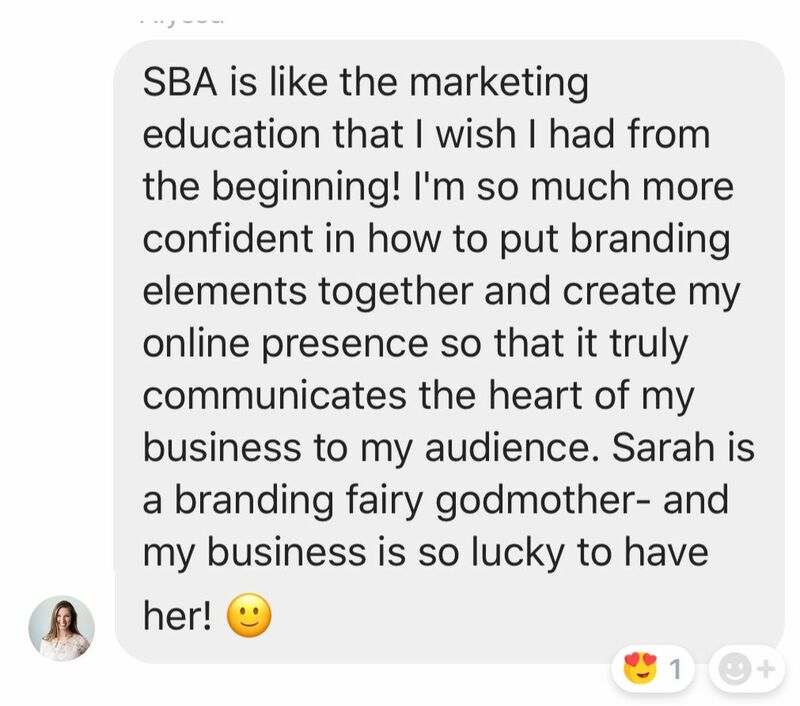 “When I joined Sarah, I didn’t know anything about branding. I had no prior experience, and now I’m able to create my own brand! 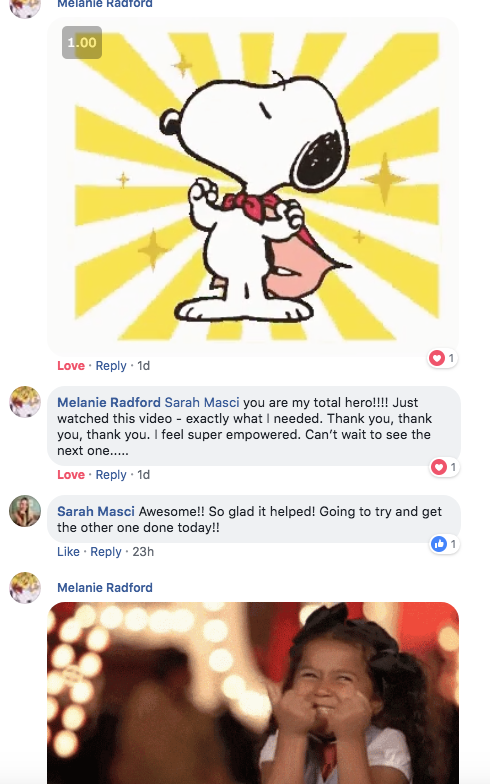 Thank you Sarah for being so supportive in the community.” ~ Louise K.
I am so confident that Simple Brand Academy can help you get to the next level in your branding journey, and go beyond anything you could do on your own, in such a short amount of time, that it comes with an unconditional guarantee of satisfaction. 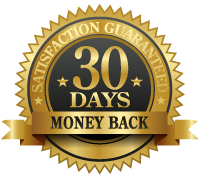 If you are not 100% satisfied for any reason, or for no reason at all, just let me know within 30 days. I’ll refund your money in full. And you can even keep the workbooks and templates that you’ve received up until that point. I can’t think of a more fair way for you to try my course. How long does this course run? 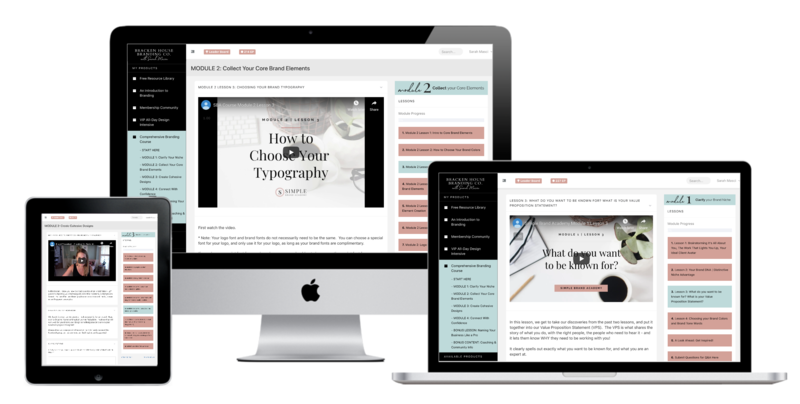 Once you go through the 8-week course you will be added to my DIY Design Alliance membership for 10 months, with the option to keep going and pay monthly thereafter. 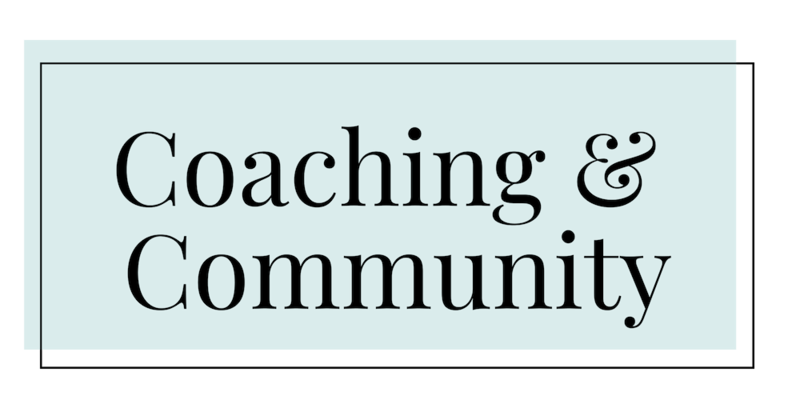 I will continuously be creating new content around what the community needs, and we have a monthly guest expert, mastermind coaching calls and more. Yes, absolutely! I understand that you may want to join now, but not have a chance to get through all of the material right away, so you can rest assured, you will always have access to the course material – even if you don’t get to it right away! Will this really help me create a designer brand on a diy budget? Yes, if you follow along and commit to doing the work, ask me questions when you’re stuck and take action, you will have all the tools, skills and resources that you need to continuously create a professional looking brand & graphics that you’ll be proud to show off. When is the next time you'll open doors? It’s too soon to tell. I hope to re-launch again sometime later this summer, but I am not 100% sure when that will be. How many hours should I plan to spend on this? 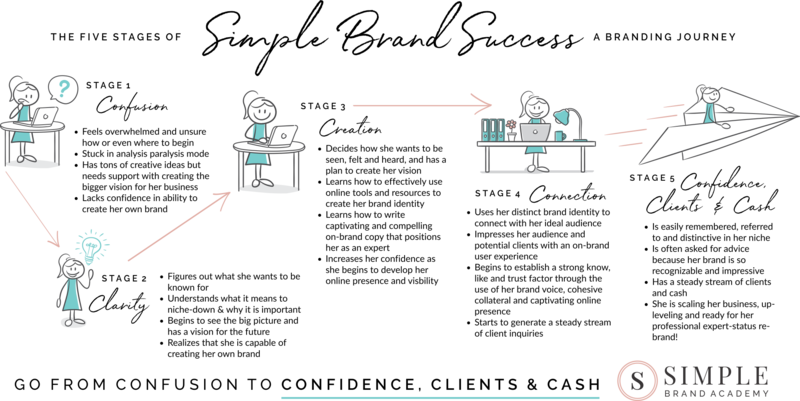 Modules will be delivered bi-weekly, and you should plan to spend about 1-2 hours watching them, with another 3-4 hours for implementation. You should plan for approximately 4-6 hours every two weeks. Some weeks will be less than that. Will there be live calls? Yes! Live Q&A calls will happen weekly. You will be able to submit your questions ahead of time, or ask questions on the call. All calls will be recorded in case you cannot attend. Will I learn about Social Media Marketing in this course? 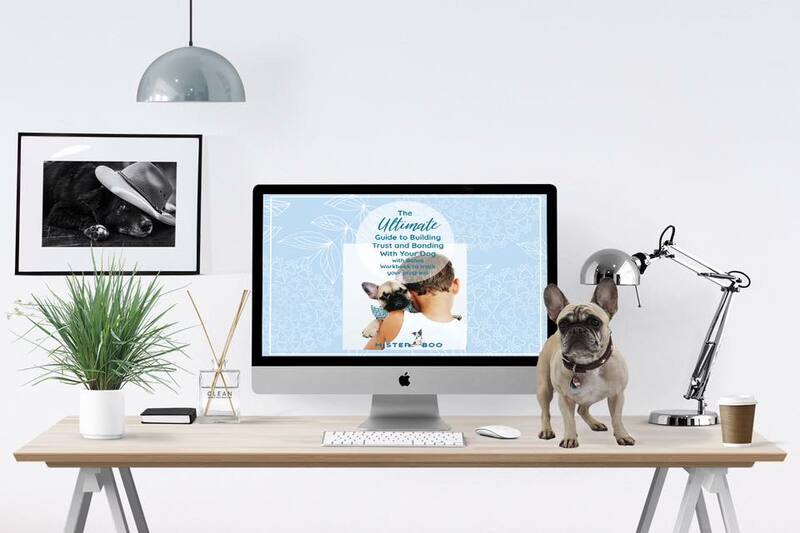 While this is not specifically a course about Instagram, Pinterest or Facebook, your new visual brand, along with the collateral and templates that I will show you how to create, will be perfect for using on social media. You will notice an immediate improvement in the cohesiveness of your branding, across all social media platforms that you apply it to. How much access will I have to you? I’ll provide daily feedback and coaching inside of the private student’s-only Facebook group, and you’ll be able to ask questions through a private question form. I’ll answer your questions inside the group or on the live Q&A calls. This course does not include 1:1 brand coaching or design. If you want 1:1 brand coaching or design, you can Book Me For A Day at www.brackenhousebranding.com/day. Once you enroll in the course, you will receive a welcome email, with the entire course schedule and timeline. You will also receive a private invitation to our exclusive course community! This will help you get oriented in the course and community, and will lay the foundation for what’s to come over the next 8 weeks. Our first Meet & Greet call with take place on Friday, April 12th at 1pm ET. Module 1 kicks off on Monday, April 15th. Modules will be delivered bi-weekly, with an implementation week in between each one. to stay confused, stuck and overwhelmed.